Join us for the Collective Call to Action's next book discussion and webinar (July - August) which will be facilitated by the Association​ ​of​ ​Mathematics​ ​Teacher​ ​Educators​ ​(AMTE)​. The TODOS: Mathematics for ALL, 2018 conference is June 21 - 23, 2018 in Scottsdale, AZ. The theme is It's ALL about ALL Students Learning Quality Mathematics: Advocating for Equity and Social Justice. Keynote speaker is Dr. Maria del Rosario Zavala. The CCTM conference program includes a presession workshop with Julie Aguirre (co-author of The Impact of Identity on K-8 Mathematics: Rethinking Equity-Based Practices) on Thursday, August 2; a keynote with Andrew Stadel (creator of estimation 180) on Friday, August 3; and featured speakers including Robert Q. Berry III, Eugenia Cheng, Doug Clements and Julie Sarama, and others. It is almost officially Summer! Many of us are out of school. Some of you have already started working in summer school programs. Others are living through the last few tough days of the school year. So now what? We need a little time to relax and recharge. This down time can be used productively to read about new and different ideas and to reflect on the educational system in which we work. We use this time to begin the search for ways to improve our work so that next year is even better. This summer I have been working through David Sousa’s How the Brain Learns Mathematics with one of my summer classes. One of the topics that has caught the attention of many teachers in my class is using a Layered Curriculum. The Layered Curriculum comes from Dr. Kathie Nunley’s work and fits Sousa's ideas of a brain friendly environment. One of the key components is student choice - having the power to choose can be extremely motivational. It can provide freedom that students rarely experience in a mathematics classroom and is a natural way to differentiate. Some of the choices can be as simple as different options for homework or allowing students to select two of four different problems. Students could also have some choices in how they learn. The second critical component is accountability. Students get credit for learning the material, not just completing the assignment. The final component seeks to promote higher level thinking by layering the curriculum. You start at a foundation level C where the work included is the basic skills and information. In layer B, students apply the information in multiple settings and the final layer involves analysis. This information has been around more than fifteen years yet it was something new for my teachers to think about in connection to the brain and learning. Each teacher has discussed what they might do with it or how they could modify the approach to better help their students learn. The bottom line for all of us is "What strategies, new or old, will help my students learn more?" As leaders, we work in different capacities but we still focus on the goal of increased student learning. No matter what you choose to do this summer, make sure it helps you relax, renew and reach your goals. NCSM has many opportunities that you will notice in this email. Take advantage of as many as you can in your search for ways to help provide more mathematics for each and every learner. 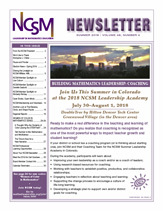 Our NCSM Summer Newsletter is Out! For some of us, switching away from paper to an online format for a newsletter gets some getting used to. Where’s that copy to tuck in my suitcase and read on my vacation? Where’s that copy to stack on the pile of things to read in my office? Before, you didn’t need to DO anything—the NCSM Newsletter came in the mail, and when it did, you could read it cover to cover. But now? Like many organizations, the NCSM Board voted to update our Newsletter to an online format, where we could have an all-color magazine look—even having the pages turn with a press of the finger! A different time, a different routine. 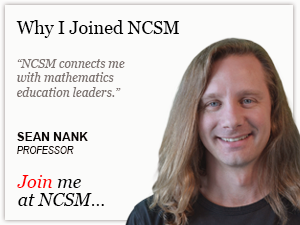 Go to the NCSM website and log into your My NCSM account. Clicking on NCSM Newsletters gets you into Periodicals, E-News, Journals, Monographs, and Newsletters. Your Summer Newsletter awaits. Happy reading your new stack of online issues! With your devices you can even take these issues on vacation! Have You Read the NCSM Position Papers? What does NCSM believe about important issues in mathematics education leadership? How is NCSM helping mathematics education leaders provide research-informed answers to the issues we face in our local district? The postion papers can be found on the NCSM website under the Leadership Resources tab. The NCSM Board hopes that you will find our positions, the research and literature that support them, and the practical steps you can take to implement each position, to be of use to you and your colleagues.